Burlington residents listen to Tom Angotti speak at Contois Auditorium. People who arrived at the housing summit with concerns about unbridled development probably didn't leave feeling any less worried. The keynote speaker, Tom Angotti, a professor of urban affairs and planning at Hunter College, came bearing stories of gentrification and development gone awry in New York City. "We’re seeing that happen here," a woman in the audience told Angotti. "So what do we do?" "Three suggestions," offered the visiting professor: "Organize, organize, organize." Burlington residents have been doing plenty of that already. Members of Save Open Space Burlington, which formed when Burlington College was selling a large tract of lakefront land to developer Eric Farrell, have joined forces with people concerned that putting housing in the South End's Enterprise Zone will squeeze out artists and business owners. Both groups came together to plan Wednesday's event, along with members of the neighborhood planning assemblies. Held at Contois Auditorium in Burlington City Hall, it was billed as a response to Mayor Weinberger's 18-point housing action plan. In a plan presented to the city council last month, the mayor offered a number of strategies to fix what he's termed a housing crisis. He's repeatedly made the case that a severe shortage of housing has made rent and home prices untenably high for many. This issue dominated the mayoral election last March. Key to the solution, according to the mayor's plan: constructing more units. But Wednesday night, people pushed back. "New market-rate housing raises rents," Angotti argued. "And that forces out people who operate at the margin." "Do we have any idea how many units will have to be built to bring down rents?" asked Charles Norris Brown, one of the organizers in the South End. He suggested that the city's "obsession with housing" may "kill the creativity" in the South End." At least eight of the 12 city councilors attended. The body agreed to postpone a vote on the mayor's housing plan until after the summit. Weinberger didn't come, though his housing point person, Brian Lowe, was there. 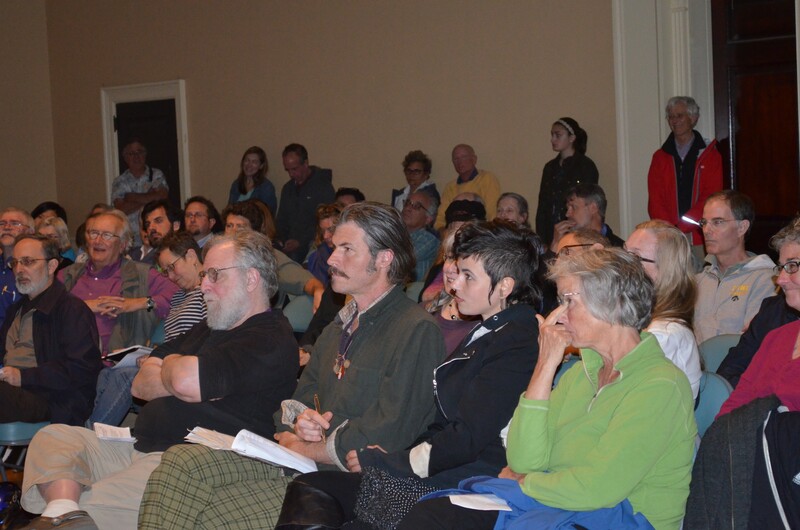 Attendees weren't totally opposed to new housing. People plugged construction of "tiny houses" — a suggestion also included in the mayor's plan. Ruby Perry, a member of Save Open Space Burlington who lives in one of these houses, told the audience that, particularly in light of climate change, it's important to "live lightly and to build lightly on the earth." To expand the stock of student housing, Charles Simpson suggested developing cooperative housing instead of allowing "circling sharks of opportunistic investors" construct large, profit-generating dorm structures. At the very end of the meeting, Michael Monte, chief financial officer for the Champlain Housing Trust, which builds and manages a large number of affordable housing apartments in the region, stood up in the audience and attested to the dire need for housing. "There's a real crisis in Burlington and Chittenden County," Monte said, choking up. Referring to the homeless population, he added, "They’re living close to the earth, but they don’t want to be there."